• More than 99% of incoming freshmen receive some sort of financial aid, including scholarships, grants, low-interest loans, and student employment. Knowledge has power.It can inform the mind and motivate the heart. 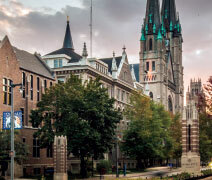 At Marquette University, the search for and sharing of knowledge are important parts of what we do. And since we are a Jesuit Catholic university, faith serves as the foundation for the way we teach and the values we instill. Here you’ll be encouraged to seek new information. You’ll be pushed to think critically. And you’ll do it all within the context of using that knowledge for the greater good. When you combine a drive for excellence with a passion for service, you can make an impact. And after the transformative experience of a Marquette education, you will be the difference. Marquette operates on a direct-entry system, meaning you’re admitted into one of our seven colleges and you can begin taking courses in your intended major right away. If you’re pondering your major, don’t worry. You are one of the more than 20% of students who are multi-interested (what others call “undecided”). We offer 84 majors and 79 minors and professional programs, including Pre-dental, Pre-law, and Pre-med. And all students receive plenty of guidance throughout their Marquette career. Magis—the drive to do more and be more. At Marquette, we strive for more. We encourage our students to lead with lasting impact by passionately serving others. In fact, our most valued tradition is our tradition of service to others; 80% of our undergrads participate in community service. We also have clubs and activities for every interest—almost 300 from which to choose. 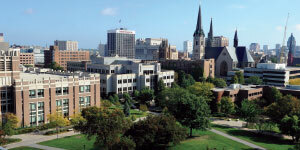 Marquette’s campus is located near downtown Milwaukee, a vibrant city on Lake Michigan. Here you’ll enjoy world-class festivals, professional sports, and entertainment. Milwaukee is also home to several Fortune 500 companies and plenty of internship opportunities. 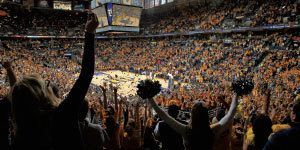 When you come to Marquette, you’ll prepare, as St. Ignatius said, to go forth and set the world on fire. Here you’ll learn what it means to be the difference.